Tags allow organizations to track additional information about activities and clients served by their students and trainees. 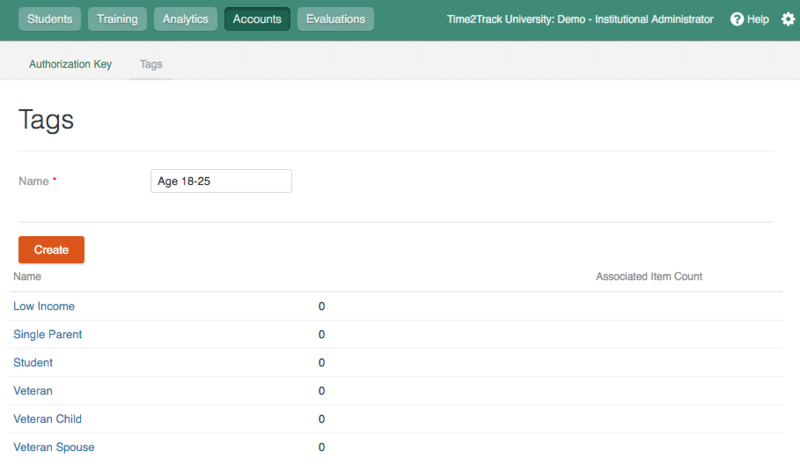 Time2Track currently tracks basic demographic information for clients, but Tags provides a way to expand those options for organizations who need to track demographics such as socioeconomic status, military service, or specific age groups. Tags also provide a way to track additional information for activities, such as diagnosis or treatment method. As an institutional user, you have the ability to add a list of tags that students can use to attach additional information to their activities and clients. Click Accounts then Tags, then enter the Name of your tag and click Create. That's it. Your trainees can now select these tags and apply them to their activities and clients. When defining tags that are describing a specific demographic, precede the tag description followed by :: with the word(s) that describes the demographic. By preceding the tag with the demographic description, the tags will always display together in the drop down list for trainees and are easily identifiable when they are included in reports.